I can’t be bothered with ironing. I have four kids and far too much going on. It’s enough that I have clean clothes for everyone on a daily basis, I really can’t worry about having them ironed. However, I also can’t stand sending everyone off for the day in terribly wrinkled clothes. Especially when we are going to church. Sunday mornings are especially hectic for us getting four kids dressed up and out the door on time. This past Sunday was really crazy and about two minutes before we had to walk out the door, my son came walking into my room holding his white dress shirt and it looked like it had been rolled up in a ball and thrown in the back of his closet. Totally not acceptable to wear like that, but I was out of time and no time to iron. 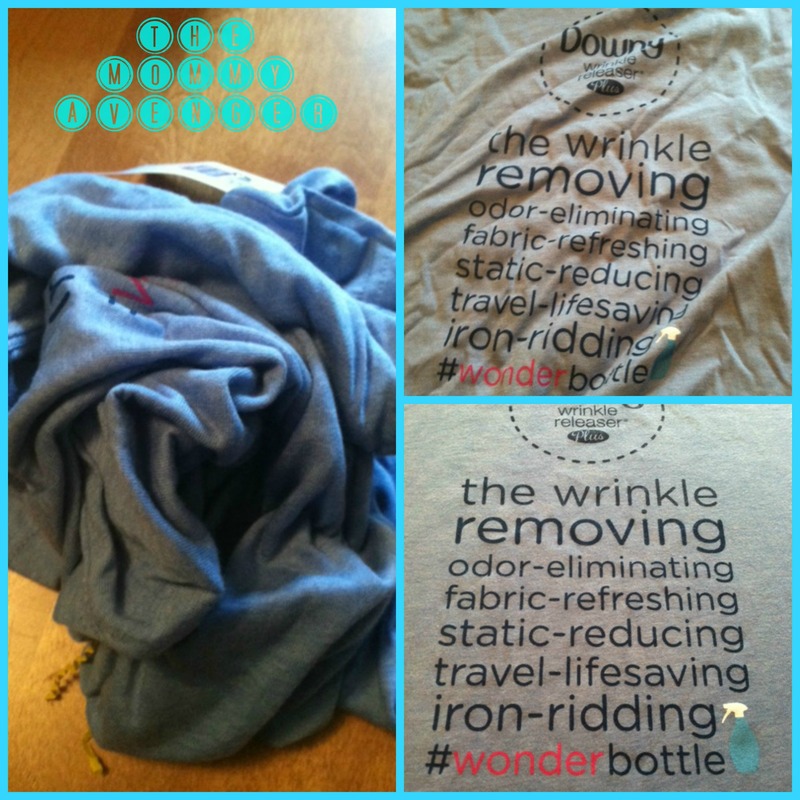 I remembered that I had just received a package from Downy the day before with their Downy Wrinkle Releaser Plus (aka The #Wonderbottle) in it. I quickly went to grab it and thought it would be worth a shot to try it out. I sprayed it on his shirt and gently wiped my hand across the fabric. Much to my surprise, the wrinkles disappeared right before my eyes. Seriously! I was so impressed. He threw his shirt on and we were out the door and no one ever would have known just how wrinkled his shirt was because there wasn’t a wrinkled trace to be seen. I am all about products that make life easier for busy families. The next day, when I had more time, I decided to try it again on other fabrics. I got the same awesome results! I had washed a table runner and dried it, only to have it wrinkled beyond belief. I sprayed it on the fabric and right away the wrinkles released and it was once again presentable. Oh happy day! This girl found something that works! Not only does it work ridiculously well, it smells really good, too. Kind of like fabric softener sheets. Really fresh, but not overpowering. The product works on just about all fabrics with equal results. In addition to getting the wrinkles out, it can be used for a fabric refresher (cloth furniture, pet beds, curtains, etc.) and it can get rid of static cling. If you still want to iron, you can use it as an aid in place of starch. I am so excited to find a good product that works. I will be keeping a supply of this on hand in my house as I have already used it so many times. Good news is they also have a travel size one. I am excited about this for when we go on road trips and have our clothes wrinkled in the suitcase. Or for when I have a meeting to go to, I can do touch ups on clothes that may have been wrinkled during the ride there. I highly recommend this product to you! 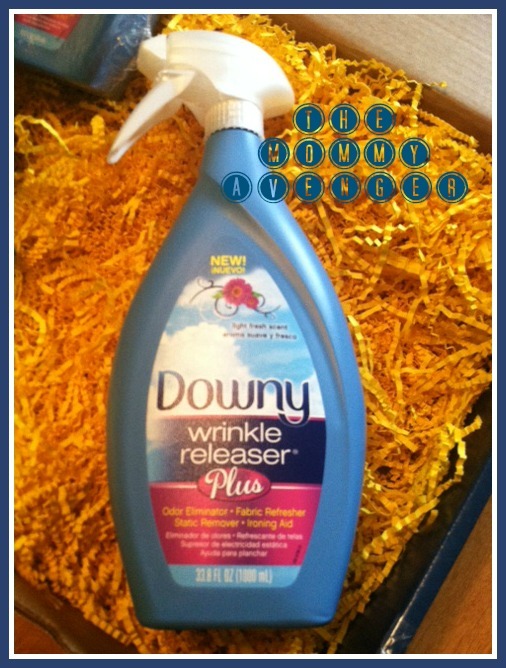 You can pick up Downy Wrinkle Releaser at Walmart, Target, Walgreens and many other grocery stores.